Outline Sam and Dean make the decision to kill Amara. Meanwhile, Castiel tracks down Metatron in hopes of gaining any new information on the Darkness. Teenager Goldie Schmidtlapp is complaining to her friend about how strict her mother is with her, when her friend has to leave. Goldie is left alone for a time before Amara makes her presence known. Amara confronts Goldie, telling her she wants to be like her and proceeds to consume Goldie's soul. A now-teenage Amara arrives back at Crowley's Lair to find Crowley waiting for her in her room. Angry that Amara has been going out and feeding, leaving him to clean up after her, Crowley grounds her. Amara in defiance attempts to leave her room, only to be telekinetically thrown across the room by Crowley. He reminds her that while she is strong, he is stronger, eliciting the response "for now" from Amara before he takes his leave. In Fall River, Massachusetts, Sam and Dean continue investigating their previous case, trying to find more soulless people in order to track down Amara. They bemoan their lack of leads. Dean asserts finding her victims to be the best lead they have, but Sam counters, mentioning it's time to take Cas off the bench. After discussion, Dean agrees and places a callto Castiel. Cas tells Dean he has found no new leads from angel radio or any new info on Metatron while he has been holed up in the Bunker, bingeing on daytime TV talk shows. Dean chastises him for switching from quality TV like The Wire or Game of Thrones and encourages Cas to turn off the TV altogether and get outside for a bit. Meanwhile, Sam is fielding a call from Detective Madsen, letting the boys know that Len is dead. Back at the Bunker, Castiel puts on his jacket and approaches the Bunker door, but has a flashback to his trying to kill Dean before Rowena removed the spell, his torture by the angels responsible for Hannah’s death, his attempt to kill Crowley, and even his fight with Dean at the Bunker as Dean succumbed to the Mark of Cain. The flashbacks force Castiel to return to Sam's bedroom and continue watching TV. At Crowley's Lair, Jervis is discussing demon personnel shortages and lack of guards for Amara, due to her having eaten most of the demons in the Court. Crowley expresses his disapproval and assigns Jervis to guard the door to Amara’s room. At the police station morgue where Len's corpse is being brought in, Sam and Dean realize they smell sulfur in the hallway and they discuss the ramifications of a demon having killed Len. They witness a commotion made by Goldie as uniformed officers bring her into the station. They confront Detective Madsen and ask to speak with Goldie after learning that she tried to kill her mother. Meanwhile, Cas continues watching daytime TV. The news plays a clip of a murder, shot by a witness on scene. Cas catches a reflection in the side mirror of a vehicle and is overwhelmed as he realizes Metatron is the cameraman. At the police station, Goldie waits in her cell. As a man approaches her, she mouths off about wanting her phone call. He snarks at her that he is not here for that, instead he is being made to clean up messes left behind by the "boss’ daughter." He enters her cell, but a few steps in is suddenly unable to advance. Looking up, he realizes he’s been caught in a Devil's trap. Sam and Dean enter the scene, and Dean makes the connection of Crowley and Amara together. Sam and Dean take the demon, Marco, back to the local motel and bind him to a chair. They begin to question him on the relationship between Crowley and Amara. Marco complains about Amara eating up all the demons and Crowley putting her on restriction. After the demon mouths off, refusing to give answers, Dean wants to kill him but Sam wants to exorcise him and save the meatsuit. However, a closer look reveals a mortal wound to the body, and agreeing that the vessel would not survive without its demon host, Dean ganks the demon with Ruby's knife. While Sam is working on his laptop, Dean re-enters the hotel room after having ditched the body. Sam is researching the location history of the smartphone taken from Marco, and finds that he had been tailing Amara, having been at the Lizzie Borden B&B, the bar where Sydney was taken, and the park where Goldie said Amara had approached her. The map Sam is using has a POI (point of interest) right near the area Amara has been working -- the Needhum Asylum, abandoned since 1963. At the asylum, Crowley enters Amara’s room and see she is sulking and surfing the internet, ignoring Crowley as he tries to talk with her. Crowley explains why she cannot feed wherever/whenever she wants, and has a ‘snack’ brought in in the form of a chained prisoner. Amara insists she is not hungry and refuses the gift. Crowley goes to leave, but instead closes the bedroom door and turns to Amara. He confesses his lack of experience and understanding in dealing with a teen and how to reach her. He explains he is terrified, and she responds with “I’ll bet.” She is aware he wants her only for the power she will wield, and that she soon won't need him anymore. At the motel, Sam wants to make sure they are really going to try to kill Amara, even though they are unaware of her power or weaknesses, or if she even can be killed. Dean agrees but worries that if they don’t try to take her on now, it might be impossible later, as she is too big a threat. Crowley acknowledges Amara's power, but asserts he has wisdom and experience, and was part of putting Lucifer back in his Cage. He proposes that while she might not need his tutelage, he can offer her his help if she will give him time and slow down on her growth. He agrees to give her protection until she decides she doesn’t need him anymore. Amara agrees. Metatron is filming a victim lying in an alley, giddy with how much the footage will get him. He taunts the man as he chokes his last breaths, and takes his wallet. He comments how he at one time could have healed the man, helped him, but he is not that guy anymore, and can’t save him. “I can,” Cas states, entering the scene. Cas confronts Metatron about his methods and kneels down to heal the man. Metatron films the healing, gloating about the great footage. Cas takes the camera and throws it down the alley, much to Metatron’s indignation: “Do you know how much stuff I had to steal, then pawn, to pay for that? !” A police car enters the alley and Cas and Metatron exit, leaving the healed victim. Inside Crowley’s Court, a minion lackey gives a report on decreasing soul collections. Crowley, rather than reading the report, is reading a parenting book on how to interact with a sulky teen. Back at Crowley's lair, Jervis hears Crowley calling from around the corner. He approaches to find Dean instead, playing a recording of Crowley from Dean’s cellphone. As the demon rushes Dean, Sam tackles him from the side and cuffs him. Other demons are heard coming down the hall, and Sam tells Dean he'll handle the goons while Dean takes Amara out. Dean enters Amara’s room where she is calmly waiting for him. Something passes between them and Dean apologizes as he brandishes Ruby’s knife. A moment passes and Crowley is heard behind Dean, tossing Dean at the wall and knocking the knife out of his hands. Crowley pins Dean to a pillar in the room, and Dean confronts Crowley for wanting to use Amara, control her. Crowley picks up Ruby’s knife and monologues about why he wasn’t able, before, to kill Dean because of their shared experiences, their "bromance." But he concludes that he feels he is ready to kill Dean today, feels different ‘Fatherhood changes a man.’ Suddenly, Amara – from behind him – hits Crowley over the head with what looks like a log from her fireplace. He spins to confront her and she freezes him. She pressures him with her power, first causing him to drop the knife, then snapping his arm and throwing him across the room, pinning him to the wall. She holds Crowley pinned with one hand, keeping Dean pinned to the pillar with the other. A beaten Metatron again gives a speech about how everyone used Castiel, prompting Cas to kick him. Sam is in the hallway being confronted by two demons. He takes the angel blade he was holding up and sheaths it, instead rushing them for a tackle. As Cas questions Metatron again, Metatron taunts him that he wasn’t fixed even though he got his grace back. Cas growls only “the Darkness’ as he grips Metatron by the throat. Crowley tries to ask Amara why she is hurting him, so she accuses him of not being able to protect her. She tells him she doesn’t need him, and that they’re done. Sam continues to fight the two demons in the hallway, trying to subdue the demons and cuff them rather than killing them and their vessels. However, one of the demons is too much for him, and Sam is forced to kill him. As Castiel continues punching Metatron over and over, Metatron begs for Cas to end it. Cas refuses to kill Metatron, shaking off the blood from his hand. Sam looks back over the two cuffed demons and the one dead one. He heads around the hallway to find Dean. Crowley is still pinned by Amara as Sam pounds on the door. Dean is loose and begins to go to Sam, but Amara pins him back to the pillar. Sam tries to get in the door but is overpowered by a vision: fingers grasping through cracks in a wall. 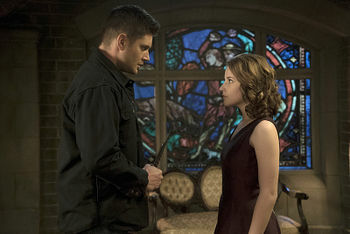 Amara threatens to kill Crowley unless he grants Dean safe passage. He agrees and she tells him to get out of her room. Dean can move as Amara focuses all her power on Crowley, but stands for a time watching her scene with Crowley play out. Once Crowley vanishes, Dean picks up Ruby's knife and approaches Amara, who scoffs at Dean's attempt to kill her. Metatron continues begging Castiel to help him. Cas turns Metatron’s words about being happy as a human back on him. Metatron admits that he was lying, and his life is terrible. Castiel tells him he is sick of having his strings pulled and won't be manipulated anymore. He orders Metatron to tell him about the Darkness. He tells Cas that people want God to be effortlessly omnipotent, magic, but the truth is that He had to work and sacrifice to make the world. He sacrificed His only kin – The Darkness. His sister. Amara asks Dean what is happening between them. Dean seems mesmerized by her. She tells him he was the first thing she saw of God’s creation after being freed after so so long. Dean represents creation to her. She tells Dean it is time for her to go, she is ready to explore the world. He still stands in a trance. She says soon she will be strong enough to do what she wants -- to settle a score. The oldest score, she tells him. Dean seems to try to raise his blade, but is unable. Sam bursts into the room, and Dean’s priorities reset as she turns toward Sam and throws him back into the hallway. As Dean starts to rush her, She throws him against the wall and he falls to the floor. He watches as she walks away. Sam, Dean and Cas are together in the Bunker, discussing Metatron’s revelation and Amara’s plans. Dean gives Cas a hard time about letting Metatron go. Cas assures them Metatron is human and not a threat. Cas asks Dean why he was unable to get a hit on Amara and she got away, and he insists she overpowered him. Sam goes to check the lore, and is overpowered again by a vision of hands reaching through cracks and the Cage suspended in nothing... As Crowley holds court in apathy and Dean begins drinking in the Bunker, Amara walks through a crowd of people looking at the city and lets her freedom soak in. Sam: But what I don't get is, why would Crowley have Amara on Earth in the first place? Wouldn't it be smarter to keep her in Hell? Dean: Yeah, but then he'd have to spend more time there and he hates that place. Crowley: You have tremendous power and soon you'll have even more. But I have something you lack... wisdom, experience. I helped put Lucifer back in his Cage. I rose through the ranks of Hell, defeated all comers to claim the throne. And a few minor set backs aside, I'm still here. I don't know how to impart what I've learned to you, how to teach you. At the rate that you're growing I'll probably never get the chance to figure it out. Perhaps you don't need my tutelage, but I believe deep down in my gut I have something to offer you, if you just give me a chance. Metatron: Do you have any idea how much stuff I had to steal and then pawn to pay for that? Demon: Turn to the graph at the bottom of twenty seven and you'll see a nearly 40% decrease in soul collections in the Pacific Northwest in the past three years. An unexpected consequence of legalized marijuana? Some analysts think so, others are not quite so sure. Crowley: Do you know how disturbing it was to realize that I couldn't bring myself to kill you? I've had tons of chances over the years, some you don't even know about, but... Still, I made peace with it. Embraced my softer side, learned to accept that there was just too much going on between you and I -- Bromance. But you know what? I think I am gonna kill you today. I feel different somehow, ready. What can I say? Fatherhood changes a man. Amara: Tell me what is happening here, between us? You save me, I save you. Why? You were the first thing I saw when I was freed, and it had been so long. Maybe that's it. My first experience of His creation. You can't help but represent that for me, the sweet triumph and the even sweeter folly of what He's wrought. There's no fighting it. I'm fascinated. Metatron: The truth would make the Bible thumpers' heads explode. I mean, they want their God to be a finger-snapping all-powerful creator. They want magic, Mary Poppins. But what he did... Creation. That took work, took sacrifice. In order to create the world, God had to give up the only thing He'd ever known. He had to betray and sacrifice His only kin. The Darkness -- His sister. Amara: It's been great seeing you again, Dean, but it's time for me to go. There's a whole world out there for me to explore, and I can practically taste it. Soon, I'll be strong enough to do what I came here to do. Amara: Settle an old score. The oldest score. Sam: Guys. Bigger fish to fry here. Amara's in the wind. Dean: Yeah, God's frickin' sister. Castiel: You said you were close. Dean, how'd she get away? Dean: I'm sorry, what part of God's frickin' sister didn't you understand? She overpowered me, end of story. What's our plan here, fellas? You said you got everything you could out of Metatron, right? So where on Earth are we gonna find an answer on how to stop her? I don't suppose God's decided to share some wisdom on the matter? Sam: I'll look into the lore. "Our Little World" is the title of a song by Stephen Sondheim from the musical Into the Woods (a favorite of writer Robert Berens). The song is sung from the perspective of Rapunzel and her mother the Witch, who has her daughter locked away from the world in a tower. Castiel was watching reruns of The Jenny Jones Show. Dean: Okay, I thought you were going for socially acceptable binge watching, you know The Wire, Game of Thrones. Castiel: Yeah, well man cannot live on caviar alone, Dean. "But Jesus answered, 'It is written: 'Man shall not live on bread alone, but on every word that comes from the mouth of God.'" Marco: Yeah, well demon souls do a body good. Reference to the Milk, It Does the Body Good ad campaign. The Summer of Love was a social phenomenon that took place in 1967. Amara: If nonsensical slogans attached to idiot pictures of domestic animals counts as the world. A meme is a concept/catchphrase that spreads from person to person on the Internet. One of these is known as Lolcat. Metatron's job as a freelance videographer is reminiscent of the character Lou Bloom, played by Jake Gyllenhaal, in the film Nightcrawler. Castiel: What do you know about the Darkness? The Darkness is a British rock band that formed in 2000. Dean: Look, Cas, I'm as glad as anyone that Stella got her groove back, okay. But you let Metatron go? How Stella Got Her Groove back was a 1998 romantic comedy starring Angela Basset about a high powered stockbroker who goes on holiday to Jamaica and reevaluates her life. In the episode Amara is seen looking at cat memes what she describes as " nonsensical slogans attached to idiotic pictures of domestic animals". Later in 11.20 Don't Call Me Shurley God - aka Chuck - reveals he "started a blog. Mostly just pictures of cats." Behind the scenes pictures of the set from Production Designer Jerry Wanek. Wallpaper in the motel Sam and Dean stay in was last seen in 5.08 Changing Channels. On the wall are pictures by artist Daniel Danger. Live tweets from the cast and crew during the broadcast. Jared and Jensen on Facebook live after watching the episode together - on YouTube. This page was last edited on 2 April 2019, at 19:26.